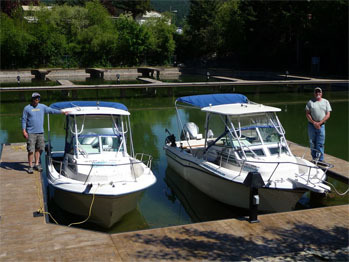 Flathead Lake Charters was established in Woods Bay, Montana in 1979 by owner/guide Jeff Rach. Having fished the sandy bars, rocky shoreline and deep trenches of scenic Flathead Lake in northwest Montana for over 35 years, Jeff has learned the migrating and feeding patterns of the famed Lake Trout. Flathead Lake is the largest natural fresh water lake in the West, located just 40 miles south of Glacier National Park in the shadow of the Mission Mountains and the Bob Marshall Wilderness area. Come enjoy our Montana fishing charters, all of the amenities the Bigfork area has to of fer in addition to fishing, such as boating, hiking, championship golf, fine dining, biking or horseback riding. 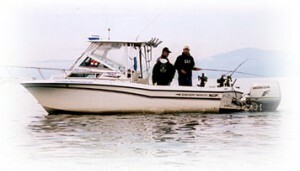 Flathead Lake Charters offers half day, full day and twilight fishing charters – everything you need to enjoy a day on the lake is provided. Flathead Lake Charters is proud of it’s high percentage of local and repeat clientele – many request our trademark Bluegrass music and view it as the “Secret to our Success”!